Power Plant Hire is a 100% family owned and run business. We are one of Ireland’s oldest hire companies. 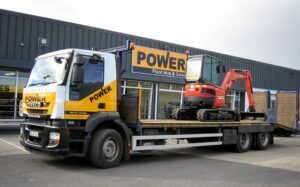 Since John Power Snr and Joan Power established Power Plant Hire in Bree, Co Wexford in 1974 we have been servicing Wexford, and the surrounding counties. In 1981 the business moved to its current location on the Dublin Road in Enniscorthy and today operates from a facility of over 15,000 Sq Feet of showroom, workshop and storage. For over forty years Power Plant Hire’s experienced and trained staff have provided assistance and advice to customers backed up by a comprehensive range of reliable and safe Tools, Plant and Access Equipment. We are active members of our trade association, the Hire Association Europe (HAE). The HAE is the leading trade association for hire and rental companies in the UK and Ireland and we are part of the SafeHire Certification scheme of the HAE.